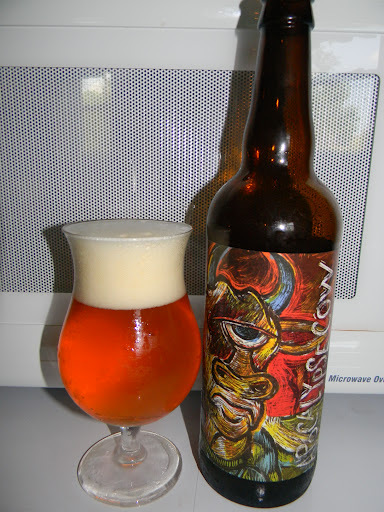 Review of Three Floyds Apocalypse Cow | Beer Apprentice - Craft Beer News, Reviews, Interviews and Info. Hello everyone. For today’s craft beer review I’m going to be trying the Apocalypse Cow produced by the Three Floyds Brewing Company located in Munster, Indiana. I can’t wait to try this bottle, so let’s skip ahead to the website, 3floyds.com, and see what kind of information we can find out about this brew. This beer has an ABV of 11.0% and comes in a 22 oz. bottle with one of the coolest labels I’ve ever seen. It poured a relatively clear golden/orange color with a slightly off white head that was both smooth and soft. The size was large, the retention time was great and the sticky lacing looked fabulous. Just a beautiful looking beer right here. Very appealing and very inviting. The nose was very citrusy to say the least. Tropical fruits of orange, pineapple and grapefruit. A strong floral hint was noticed as well. It was extremely fresh and lively smelling. A touch of mint and pine also with only a light notion of breadiness in the background. The taste was very juicy and sweet. Extremely sweet to be honest. More pineapple, orange and grapefruit citrus. A nice sting of bitterness really danced on the tongue. Just a wee bit of alcohol was tasted, but I was kind of expecting that at 11.0% ABV. Again, only the most faint savor of bread was accounted for and I even started to pick up a slight dollop of the sugars that were mentioned in the description. Not much though. The citrus remained the dominate force. All in all, it seemed a bit one dimensional, but that’s not necessarily a bad thing. The mouthfeel was a solid medium. Sticky, smooth, dry, crisp and lively. A wonderful amount of carbonation molested my tongue. A very minute bit of warmth was felt, however a great deal of flavor was left covering the palate long after each sip. Well, this is another great beer from Three Floyds. Definitely worth a try if you dig the big, hoppy beers. This brew is very sweet though, so watch out. That fact alone kind of brings the drinkability down a hair, but who cares, it’s still a joy in which to partake. I would have no problem at all drinking this again that’s for sure, however I may want to share the bottle next time. 22 oz. of liquid with a huge ABV started to get to me towards the end. Have you guys tried the Apocalypse Cow yet? What did you think? Feel free to leave a comment if you would like. Was lucky enough to find a bottle of this here in San Diego last year and I absolutely loved it. The description definitely caught me off guard and the two guys I tasted it with thought it was a little weird, but the creaminess from the lactose made it such a fresh take on the DIPA style that I loved it. Definitely hoping 3 Floyds decides to distribute out here at some point. Good review! Thanks for reading and the compliment. I really appreciate your support. As far as the beer, yeah it's really good isn't it? I always look forward to trying Three Floyds stuff and this was the first time that I ever taste the Apocalypse Cow. Needless to say, I'll be picking it up again for sure.